Tacos Mexico Rico (map, visitor reviews, 309 West Pender, Vancouver, BC, Canada, phone: 604-688-7426) serves authentic Mexican food in a casual, unpretentious atmosphere. The chicken enchiladas with verde sauce are exactly like they are in a local place in small town Mexico. Others have had the burritos and salads and are always happy. The atmoshpere is good too with the cheesy Mexican soaps and gameshows on the TV, and the service is decent – the woman who runs the place is always smiling and happy, even though her English is limited. Pictured below is the Chicken Enchilada that I ate (for around $9), which I thought was really tasty. I went with a large group of coworkers and we agreed that it was a satisfying Mexican lunch. The place is decorated in a simple style that reminds me of some of the inexpensive but honestly-good restaurants in Mexico I visited which were mainly frequented by locals. Chicken Enchilada from Tacos Mexico Rico Mexican Restaurant in Vancouver, BC, Canada. 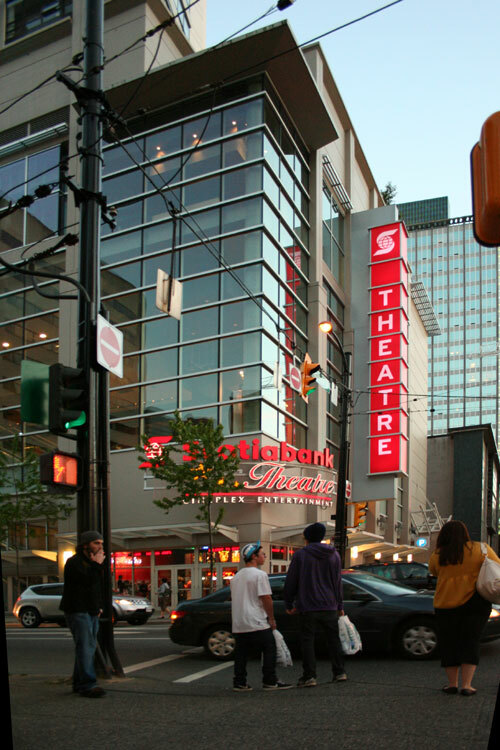 The Scotiabank Theatre in Vancouver (map, 900 Burrard St., Vancouver, BC, Canada, phone 604-630-1407) is a large movie theatre located in downtown Vancouver at the corner of Burrard and Smithe. Formerly named the Paramount, this movie theater has 9 screens and shows all the latest new releases. Inside the Scotia Theatre you’ll find stylish, modern decor, big screens with comfortable reclining seats, and several fast food restaurants including Taco Bell, Burger King, and KFC. View the theatre’s website for the latest showtimes. 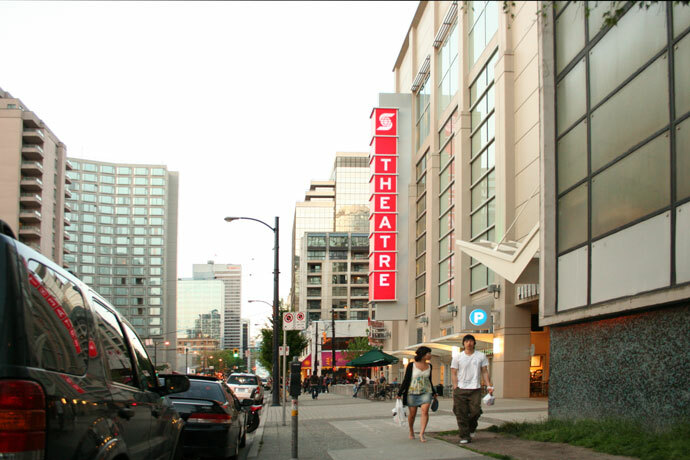 Below are some photos of the Scotia Theater taken from Vancouver’s Burrard Street (which is accessible by the Burrard Skytrain station (subway). If you’re actually looking for a Scotiabank Banking Branch with ATM, there is a full service branch just up the street at the corner of Burrard and Nelson (map). Another movie theatre in the downtown area is Tinseltown Theatres, which is in the International Village Mall at 88 W Pender, across from the Stadium Skytrain station. 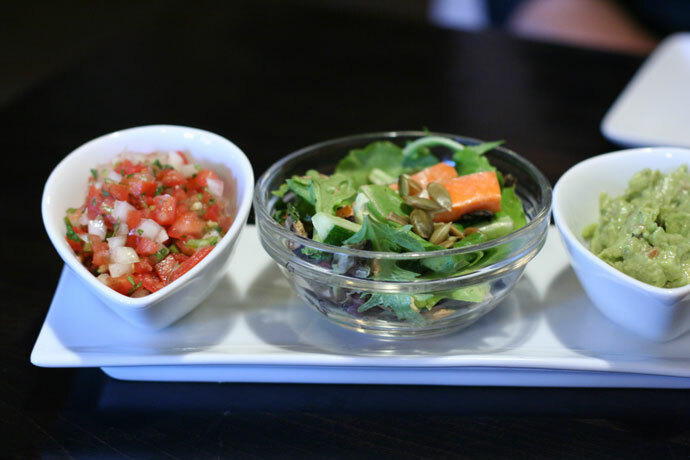 Tequila Kitchen (web site, 1043 Mainland St. Vancouver, BC, Canada, phone: 604-681-2120) is a Mexican restaurant in the upscale Yaletown neighborhood of downtown Vancouver. 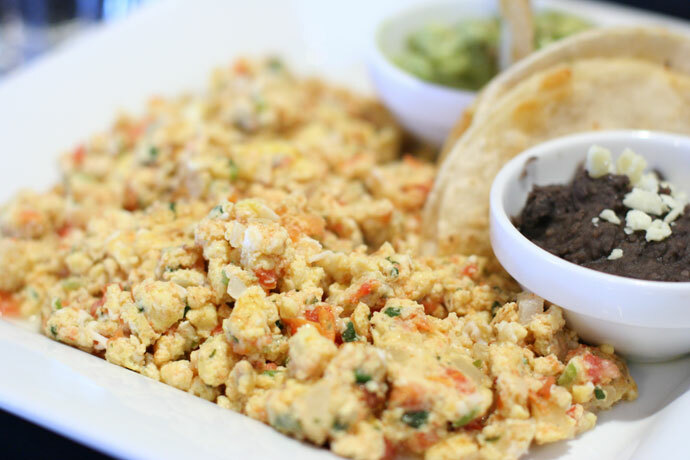 Pictured below, from their Brunch menu, are the Huevos a la Mexicana: three scrambled eggs with tomato, onion and green chile, served with a quesadilla, beans and guacamole (for around $10). Also pictured below is the freshly made salsa and guacamole, which I must say is excellent. Visit Part 1 for more photos. Fresh Mexican salsa and guacamole from the Mexican restaurant Tequila Kitchen in Vancouver. View More Restaurants in the Mexican category. 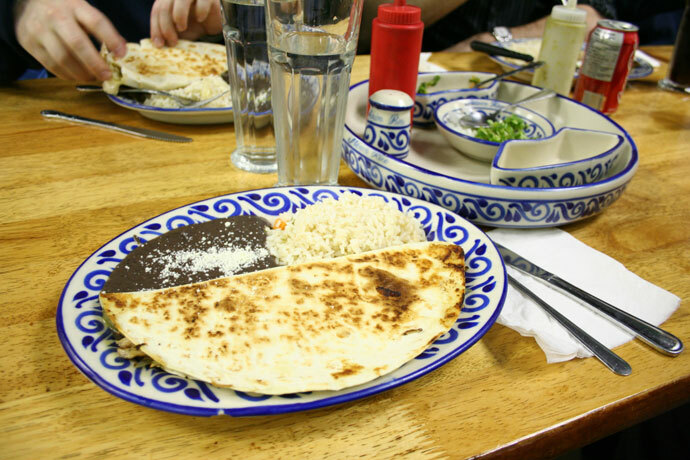 We hope you enjoy the great Mexican restaurants on Dine Out Here Vancouver.